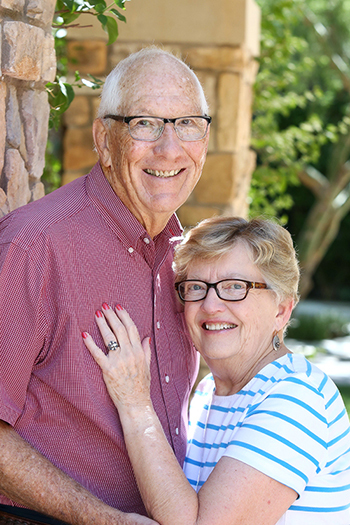 Ken and Joyce Bash moved to Scottsdale, Arizona in 1994 from Urbana, Illinois where Ken was the Chief Administrative Officer of the 250-physician Carle Clinic and Joyce used her nursing background as a volunteer in community organizations. It was natural for them to immediately join a church because in every city they have lived during their sixty years of marriage, they have not only been churchgoers, they have been involved with their talents and financial contributions. As a young married family with four children, living in Huntington, West Virginia, they were the inspiration and driving force to start a new Lutheran congregation on the outskirts of the city. Their commitment and leadership was soon noticed, and they were asked to be involved in the wider church organization. Joyce has served on various regional church committees and Ken has served on national church boards. Ken and Joyce became aware of Spirit in the Desert Retreat Center in Carefree, Arizona, a unique multi-building facility in a magnificent desert setting. It was a gift to the Lutheran Church in 1993. They were asked to serve on the retreat center’s program committee and they found that the development of retreat programs was in its infancy. The Center was largely unknown and a constituency of participants had not yet been developed. The energetic couple liked the challenge they saw, and they envisioned what the Center could become. Teaming up with Scott Haasarud, the Center’s Director of Spiritual Life and Programming and Scott’s wife, Jeannette, the two couples developed the first five-day Lutherhostel. The retreat offers fellowship, lectures, worship, music, mediation, healthy meals, and introduces participants to Native American culture, art and music. For seven years, Joyce and Ken provided hands-on leadership for the retreat that continues to be one of the Center’s most popular retreats, attracting participants every year from many states. The Bash’s are two of many committed people who have shaped the mission of Spirit in the Desert Retreat Center and who are assuring that its important work will continue. Serving with passion is what the Bash’s have been doing for sixty years.